Tarifa is a small fishing town in the province of Cádiz, Andalusia, on the southernmost coast of Spain and the southernmost point of the European continent, where the Mediterranean Sea meets the Atlantic Ocean. The town is located on the Costa de la Luz (Coast of Light) and across the Straits of Gibraltar facing Morocco and the Atlas Mountains. Tarifa’s wild coastline offers endless opportunities to explore the countryside. Horse-riding, kite-surfing, wind-surfing, whale-watching, rock-climbing and scuba diving are just a few things you can do besides the usual sunbathing, swimming, beach football/volleyball and mojitos. Ten kilometres of white sandy beaches, unspoilt countryside and some of the best wind-surfing conditions (strong winds) in Europe have established Tarifa as a true surfers paradise and one of the best beaches in Andalusia. Also the nightlife offer is much richer and diverse, then in other towns from Costa de la Luz and Costa del Sol. Near Tarifa there are many beautiful beaches and picturesque camping places. Valdevaqueros is one of the famous ones. 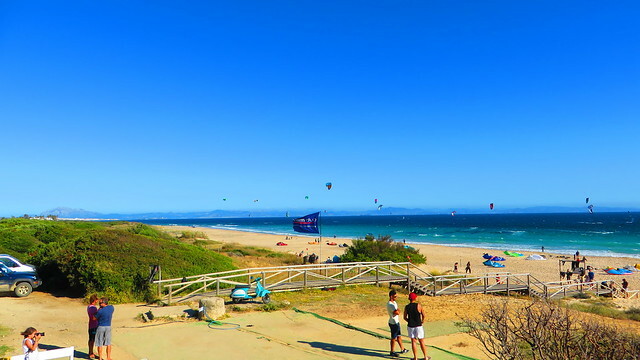 It’s located 10 Km from Tarifa in the direction Cadiz and it’s the place for practicing kite and wind-surfing, so you will see here hundreds of kites flying around the beach. Close to the beach is chiringuito Tumbao with mojitos, beer and other drinks, music and loads of young people relaxing on the comfortable sitting places. There is also a restaurant, but we didn’t try it. If you are not a fan of extreme sports, this is not the place for sunbathing or swimming, because it might get dangerous with all the people flying around with their kites, but it’s the perfect spot for relaxing with a drink and waiting for the sunset in the chiringuito. A more quiet and “danger free” beach is Playa Bolonia. Bolonia, located 13 Km after Valdevaqueros, is a huge white sand beach with wonderful turquoises shallow ocean waters and virtually there is no current (it is a very large bay), but you should take plenty of water, suncream and a sunhat. We’ve been there at the end of May, so there was nothing organized there, but as I read on the internet there should be sunbeds and parasol for rent in June, July and August. So, we had to bring everything with us, sun umbrella, food and drinks. If don’t have a car, or you don’t want to drive for 20-50 Km to go to these wonderful beaches, Tarifa has an other surprise. Just near the Tarifa Port there is a small and beautiful beach, very popular with local residents, called Playa Chica. It is one of the only beaches in Tarifa that is sheltered from the strong winds there and the only waves are generated by the big ferries coming from Morocco. This is actually the exact spot where the Mediterranean Sea meets the Atlantic Ocean so you can say that you swim in both at the same time. Besides the dynamic life and beautiful beaches, we had an other reason for our trip to Tarifa. During the last weekend of May, Ruta del Atún festival (The Way of the Tuna) is happening. From Thursday to Sunday almost all the bars and restaurant are serving tuna tapas. For every beer ordered you get also a tuna tapas, all for 3 euros. During the whole weekend, in the evening and night all the narrow streets are full of people walking from one bar or restaurant to the other, searching for tuna tapas of their taste. Usually each restaurant has a different style of tapas; we tried the tuna hamburger with patatas bravas, the wonderful tuna tartar at one of the most crowded places in town, the Lola Mora restaurant, the sushi tuna. We had a sublime dinner at Restaurante Morilla, with 3 or 4 kinds of snails, scallops and mussels, a great octopus dish and other delicious seafood. During the day, when you are not in the beach or eating, you can take a walk into the beautiful old town. The atmosphere is totally opposed to the one in the evening. The narrow streets are now almost deserted and you can observe the beautiful architecture of the white house and you can clearly see the Arab influence everywhere. Near the port, you can also visit the well-preserved Guzman castle, the remains of the medieval walls and Puerta de Jerez, the only remaining city gate. Beautiful beaches with crystal clean waters, strong winds for surfing, great food and wine, bars, restaurants & clubs closing at late hours in the night, sea trips and horse-riding, Tarifa can offer a complete experience for both family tourists and sport lovers.